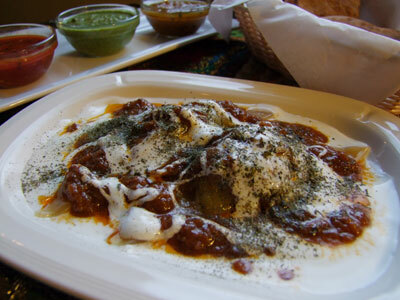 Aushak are Afghani leek dumplings filled with marinated leeks, steamed and then topped with ground beef, yogurt sauce and crushed dried mint. In a bowl, sprinkle a pinch of cayenne and some salt to the thoroughly washed and finely chopped leeks. Mix well and set aside to marinate. In a small bowl, mix the yogurt, garlic and salt. Also set aside. Put 1 tablespoon of the leek mixture in the center of each wonton wrapper. With a small brush or with your finger wet the edges of the wonton wrapper. Close each wrapper diagonally so that you end up with a triangle. Press the sides together to achieve a good seal. Repeat with the rest of the leek mixture. In a skillet, heat the oil over medium heat. Add the onions and cook until translucent and soft (5 min.). Add the ground beef and cook, stirring constantly so that the meat does not form any lumps and stays nice and loose. When the meat browns, add the salt, pepper, coriander and garlic to the mixture. Stir in the tomato paste and a cup of water. Simmer, stirring occasionally, until the liquid reduces a bit and the sauce is still moist but not too runny. Keep warm. In a steamer, bring 2” of water to a boil. With a brush, slightly grease the bottom of the steamer (to prevent the dumplings from sticking to the bottom of the pot). Arrange the dumplings in a single layer making sure that they are not touching each-other. Close the lid and steam the dumplings for 3 to 4 minutes. Spread a thin layer of the yogurt sauce on the bottom of a plate. Arrange the hot dumplings on the thin layer of yogurt. Top the dumplings with the ground beef. Drizzle more yogurt sauce on top and finally sprinkle with some crushed dry mint. Enjoy!